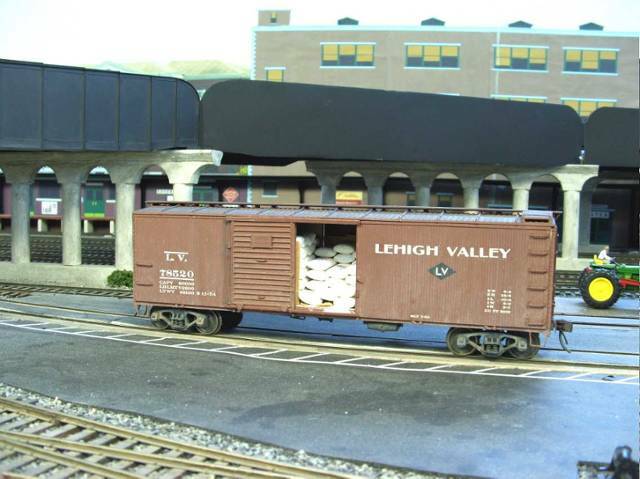 (Guest) J&C Studios O Gauge Archive Weathering Lehigh Valley 'wrongway door' box car. Topic: Lehigh Valley 'wrongway door' box car. Scratch built in styrene with some Intermountain parts. Floquil paint and some very old salvaged Walthers decals. Weathering was done with chalks and "dirty DioSol" washes. 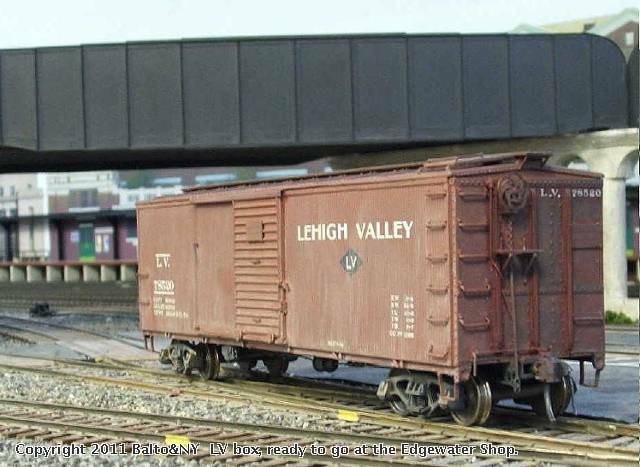 Lehigh Valley 'wrong way door' box car with the door open, to show its load. LV used these cars in the bagged flour trade out of Buffalo NY. The cars held eight hundred bags of flour at 100 lbs each. Much of that flour went to small family owned bakeries through dealers. The flour load in this model was made with Chiclets gum pieces. Since 800 of them would be far to heavy a load, only enough were used to fill the doorway. The rest of the interior is filled with blocks of foam. Pieces of brown paper from a bag were used for a Kraft paper floor covering. A bit of baking powder was added for the spilled flour dust. The top most gum pieces were marked with color pens for a brand name. To make them less palatable for stray foragers of the 6 legged crowd, the gum pieces were given several coats of Testor's Dull Coat.